Just about anything in your house can be made “smart” these days, and that goes for your garage door too. 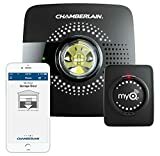 The Chamberlain MyQ Smart Garage Door Opener is particularly great because it works with pretty much any modern garage door opener you might have. It’s also insanely easy to install and takes about 10 minutes start to finish. The setup is a breeze too, so you’ll be controlling your garage door from your iPhone or Android handset in no time! It’s an awesome device, and the price just dropped from $99 to $79 so now is the perfect time to get in on the action. Open and close your garage door from anywhere with your smartphone. Easy-to-add functionality with existing garage door openers. Receive alerts when your garage door opens or closes in real time by setting up customized notifications – great for busy families who come and go from the house through the garage. Core features such as opening, closing, and receiving garage door status notifications are INCLUDED with MyQ app at no additional charge. Linking your MyQ account to Google Assistant and IFTTT requires a $1 monthly or $10 annual subscription fee. Easy to install in the garage.